Zagster bike in front of downtown Jackson Mural. 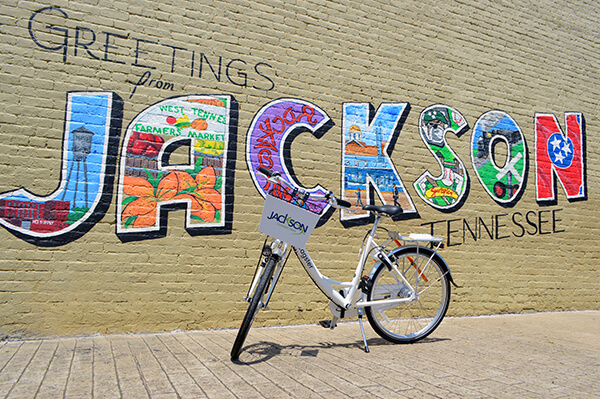 The City of Jackson and the Jackson Chamber have partnered with Zagster to bring bike sharing to Jackson. The announcement was made June 10 during the second day of the Rockabilly Gran Prix cycling races as area officials took a fun lap around Downtown Jackson on the new bikes. The City of Jackson, West Tennessee Healthcare and Toyota have all invested in the new program. The Jackson Chamber and Visit Jackson both helped facilitate the development and launch of Zagster. Locations for the bicycles include downtown Jackson at 223 North Highland near the Grubb’s Grocery; The Jackson-Madison County General Hospital, 620 Skyline Drive, near the Emergency Walk-In entrance; Lane College at 545 Lane Avenue near Saunders Hall, and Union University, 1050 Union University Drive near the Bowld Student Commons. Across the nation about half of the people that say they want to bike more often do not own a bike, hence bike sharing was born. Zagster is the leading bike share program in the U.S., operating more than 200 bike share programs in 35 states across the U.S. and making bicycles available to over 6.5 million people. Payment options include Pay-As-You-Go with your first hour free, then $1 per hour to ride; Annual Membership of $20 and Student Annual Membership of $10, each offering 3 hours of free ride time. For more information about Zagster, go to zagster.com/jacksontn or download the free app on the App Store or Google Play.